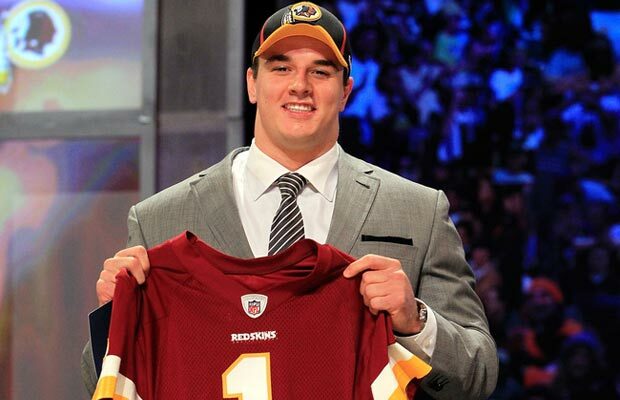 The Redskins agreed to terms with 11 of the 12 players they selected in the 2011 NFL Draft through yesterday evening, including first round pick Ryan Kerrigan from Purdue. The team spent most of yesterday securing deals with this year’s draft class. Kerrigan, Jarvis James (2nd round pick), Leonard Hankerson (3rd round pick), Roy Helu (4th round pick), Niles Paul (5th round pick), Evan Royster (6th round pick), Aldrick Robinson (6th round pick) and Chris Nelid (7th round pick) all agreed to contract terms yesteray, and it’s believed (though not yet confirmed) that DeJon Gomes (5th round pick) and Markus White (7th round pick) have also agreed to deals. Brandyn Thompson (7th round pick) was the first player in the Redskins draft class to agree to contract terms. Only Guard Maurice Hurt, the the team’s 2nd of their four 7th round selections, has yet to be signed. Although, it is believed that the Redskins and Hurt’s representatives were working towards a deal late into yesterday evening, and could reach an agreement very soon. Redskins announce all 12 draft picks have signed. Rookie deals happening fast.